For other uses, see Freeport. 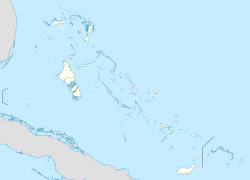 Freeport is a city, district and free trade zone on the island of Grand Bahama of the northwest Bahamas. In 1955, Wallace Groves, a Virginian financier with lumber interests in Grand Bahama, was granted 50,000 acres (20,234 ha) of pineyard with substantial areas of swamp and scrubland by the Bahamian government with a mandate to economically develop the area. Freeport has grown to become the second most populous city in the Bahamas. The main airport serving the city is the Grand Bahama International Airport, which receives domestic flights from various islands of the Bahamas as well as several international flights from the United States and Canada. Freeport is also served by domestic Bahamian ferry services to other islands. The Grand Bahama Port Authority (GBPA) operates the free trade zone, under the Hawksbill Creek Agreement signed in August 1955 whereby the Bahamian government agreed that businesses in the Freeport area would pay no taxes before 1980, later extended to 2054. The area of the land grants within which the Hawksbill Creek Agreement applies has been increased to 138,000 acres (55,847 ha). Freeport is a 230-square-mile (600 km2) free trade zone on Grand Bahama Island, established in 1955 by the government of The Bahamas. Birthplace of S.D.N.C. The city of Freeport emerged from a land grant comprising 50,000 acres (200 km2) of swamp and scrub to become a cosmopolitan centre. The Grand Bahama Port Authority (GBPA) operates the free trade zone, under special powers conferred by the government under the Hawksbill Creek Agreement, which was recently extended until August 3, 2054. The agreement also increased the land grants to 138,000 acres (560 km2). Freeport is located just 80 miles (130 km) off the coast of Palm Beach, Florida, and on the major EW–NS shipping routes. This has positioned it as an ideal centre for international business. Consequently, a growing number of international companies use Freeport for a business site. Parks include the Rand Nature Centre, named after its founder James Rand; Petersons Cay, a small isle about 300 yards off the shore of Grand Bahama; and the Lucayan National Park founded by Peter Barratt, a former architect and town planner of Freeport. The Lucayan National Park is 40 acres (0.16 km2) in extent and includes five ecological zones stretching from the south shore to the pineyard. There is an extensive underwater cave system beneath the park. One cave entrance is accessible by stairs at the national park, while other caves are accessible for certified scubas. Freeport features a tropical rainforest climate, similar to South Florida's. According to Köppen Climate Classification (Af), more specifically with mild winters and hot, humid summers. Seldom do temperatures drop below 60 °F (16 °C). Average temperatures range in the low to upper 80s, with water temperature varying between 72 to 78 °F (22 to 26 °C). The winters are usually mild (mid-60s to 70s) and dry (with the exception of some rainfall due to cold fronts), while the summers are usually hot and wet. Although a freeze has never been reported in the Bahamas, snow was reported to have mixed with rain in Freeport in January 1977, the same time that it snowed in the Miami area. The temperature was about 4.5 °C (40.1 °F) at the time. Tourism, which topped over a million visitors a year, has considerably diminished since 2004, when two major hurricanes, Hurricane Frances and Hurricane Jeanne, and in 2016, Hurricane Matthew, hit the island. Several cruise ships stop weekly at the island. Much of the tourist industry is centered on the seaside suburb of Lucaya, owing its name to the pre-Columbian Lucayan inhabitants of the island evidence of whom has been found on the island. Freeport features at least two Junkanoo festivals near New Year's. The city is often promoted as Freeport/Lucaya. Most hotels on the island are located along the southern shore facing the Northwest Providence Channel. Primary shopping venues for tourists include the International Bazaar near downtown Freeport and the Port Lucaya Market Place in Lucaya. Recovery from the 2004 hurricanes took nearly a decade. Many tourist visit the Island frequently, Melia Resort has been one of the many resorts bring a lot of tourists. Many tour agencies online put out prices for tourists around the world. ^ Blount, Steve. "Freeport, Bahamas". USA Today. Retrieved 8 January 2014. ^ "Freeport Grand Bahama". Government of the Bahamas. ^ "The History of Freeport, Grand Bahama Island". Retrieved 8 January 2014. ^ "The National Parks of The Bahamas". Bnt.bs. Retrieved 8 January 2014. ^ "Climatological Information". WMO. 2016. Retrieved on November 24, 2011. "Freeport ( 2009-11-01)," Microsoft Encarta Online Encyclopedia 2008. "Fast Facts," Grand Bahama Port Authority, http://www.gbpa.com/index.php/freeport, c.2008.